Babies prefer being born naturally-100% organic. There aren’t drugs to interfere with their senses. They can be alert, responsive and ready to fall in love with you. Babies tend to like the peaceful, relaxed atmosphere of their own home. The lights are low, the sounds and smells are familiar. Some believe this doesn’t make a difference to a newborn, but we do. Babies born at home aren’t separated from their mother until they have snuggled in her arms for a good long while. All of our assessments and initial checks can be performed while the baby is in the mother’s arms. We don’t do any routine procedures to your baby. 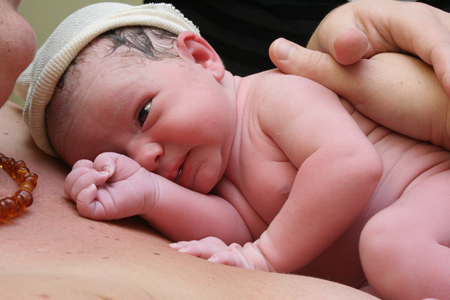 Our newborn exam is done only after some time has passed and you have had precious time to bond with your baby.